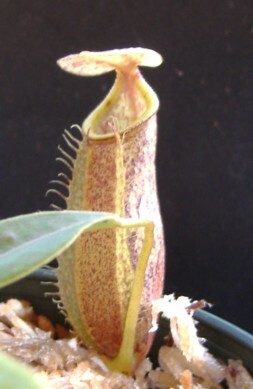 Nepenthes gymnamphora X izumiae is a naturally occurring hybrid from Borneo Exotics. I just received this plant so I don't have much experience yet with it. It is growing outdoors in full sun as a highlander. This may turn out to be a clumping hybrid because N. gymnamphora tends to clump and put out many side growths. It also doesn't get very large. I've also found that N. izumiae isn't a very quick grower for me and a bit difficult for some reason. I suspect that the initial N. izumiae offerings were small plants and that has something to do with it. As this hybrid grows out I'll have more information on it. It should be fairly available for some time since I believe this is in tissue culture and not a seed grown first offering hybrid.